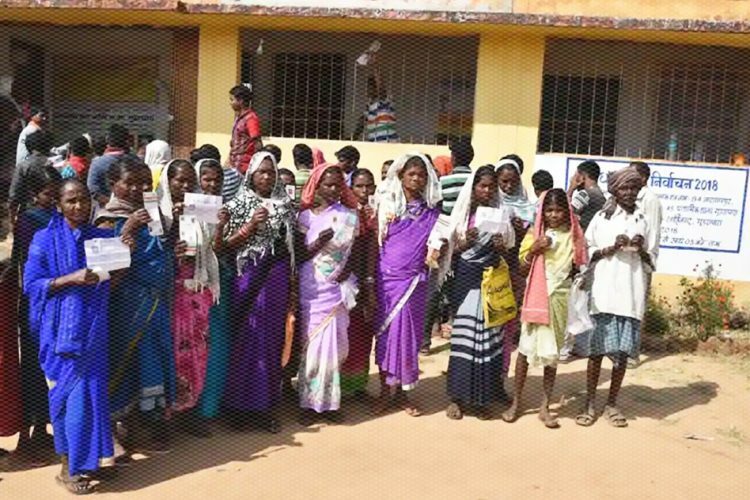 The Election Commission on Wednesday, December 13, issued a show cause notice to Congress President Rahul Gandhi for violating The Representation of the People Act (RPA), 1951. Show cause notice means an order issued by court for explanation on an incident, misconduct, etc and giving reasons why action should not be taken against the party. What norm did Rahul Gandhi violate? Rahul Gandhi gave an interview to a Gujarati channel a day before the second phase of the Gujarat polls, in violation of the RPA. He also attacked PM Modi over GST, demonetisation and accused the party of evading important questions related to the development of Gujarat. (c) propagate any election matter to the public by holding, or by arranging the holding of, any musical concert or any theatrical performance or any other entertainment or amusement with a view to attracting the members of the public thereto, in any polling area during the period of forty-eight hours ending with the hour fixed for the conclusion of the poll for any election in that polling area. The EC issued a notice to Gandhi after BJP’s Gujarat unit submitted a complaint. “As per the Model Code of Conduct, such interviews are not permitted. We’ve learnt from the EC, too, that 48 hours in the run-up to polls, interviews can’t be given. Is Congress so insecure? Only Rahul Gandhi can answer,” said BJP leader and Union Minister Piyush Goyal, reported The Hindu. The commission has instructed Gandhi to furnish a response by 5 pm on December 18. The EC also directed the Chief Electoral Officer of Gujarat to file an FIR against all media houses that aired Rahul Gandhi’s interview. 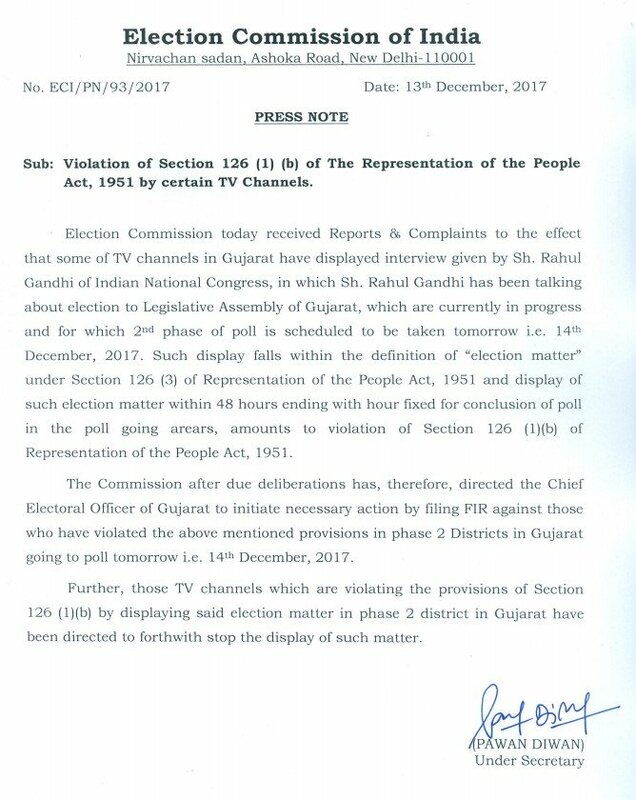 “Further, those TV channels which are violating the provisions of Section 126 (1)(b] by displaying said election matter in phase two district in Gujarat have been directed to forthwith stop the display of such matter,” it said in the press release. 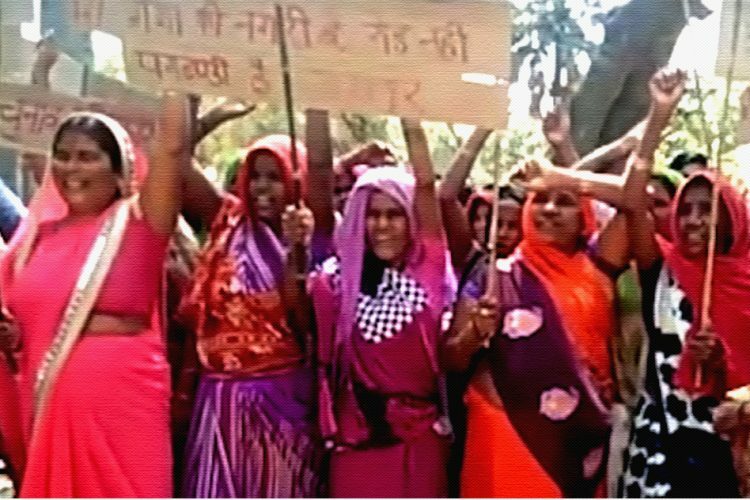 In retaliation, the Congress accused BJP of using EC “as a toll for its political gains”. Addressing a press conference, Congress spokesperson Randeep Surjewala accused BJP of allegedly threatening journalists. 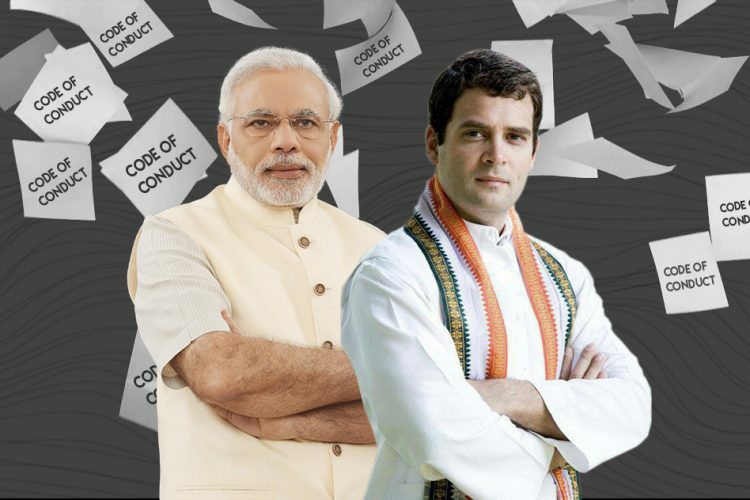 “When Congress President-elect Rahul Gandhi gave interviews to a few Gujarati news channels, BJP, in the name of Election Commission, threatened to jail the journalists of those channels for broadcasting it. We condemn this arrogant behavior of BJP,” he said, reported The Indian Express. 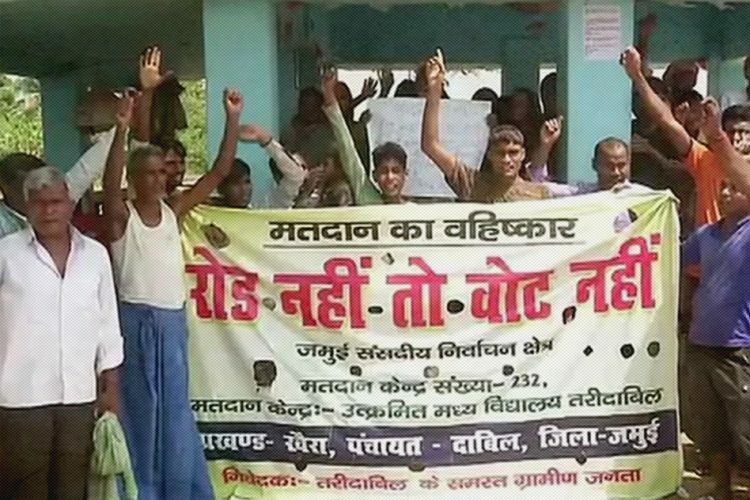 The ruling party’s main opposition was fumed and mentioned the 2014 Lok Sabha Elections when PM Modi showed the BJP symbol on voting day but the EC didn’t Act. “In 2014 elections, Modi ji even showed BJP symbol on voting day but the EC didn’t act. BJP held a press conference just before 1st phase of Gujarat elections. These double standards won’t work and the first FIR should be filed against PM Modi and other BJP leaders instead of the media,” said Surjewala. Alleging “double standards”, Surjewala also questioned why no action was being taken against PM Modi, Arun Jaitley and Amit Shah on the same ground. He said that Jaitley had released the party manifesto on December 8 in Ahmedabad, PM Modi had held four public meeting on December 9 and Shah addressed a press conference in Ahmedabad on December 13. The Congress accused Gujarat Chief Minister Vijay Rupani and Gujarat BJP Chief Jitubhai Vaghani of making threat calls to media houses for airing Mr. Gandhi’s interview. 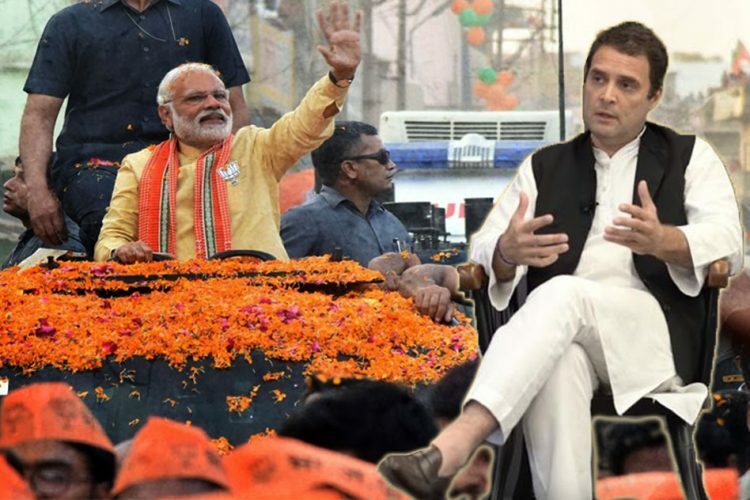 “BJP is very angry, the Prime Minister’s Office and the Chief Minister himself is calling up television channel offices and their editors threatening them with imprisonment for airing Rahul Gandhi’s interview,” said Surjewala, per The Hindu. The Election Commission took the appropriate decision of issuing a show cause notice to Rahul Gandhi for violating election norms. Fair elections are the cornerstone of a democracy and all violators should be brought to justice by the law. The phrase “all violators” holds utmost significance here. After casting his vote, PM Modi does a roadshow in Ahmedabad, with people cheering him as he passes showing off his inked finger. 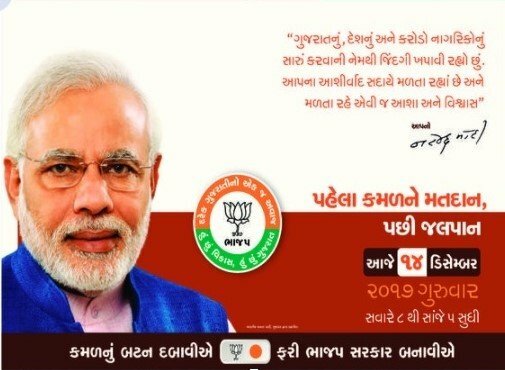 PM Modi is doing a Road Show after casting his Vote in Gujarat. The roadshow violates provisions of the RPA as well. 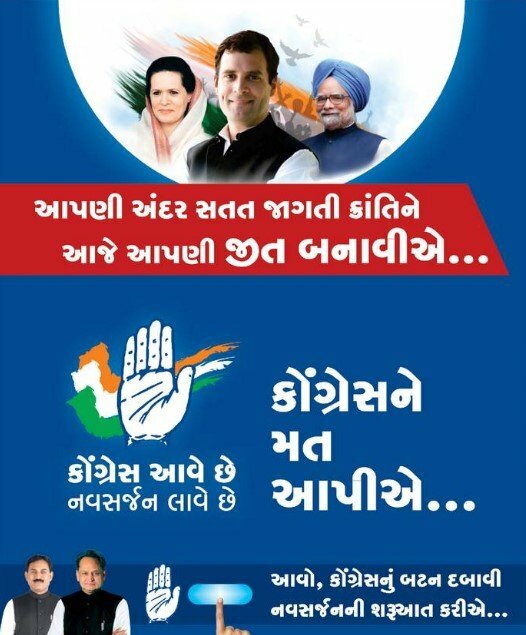 In today editions of prominent Gujarati dallies, both BJP and the Congress carried half-page ads, in clear violation of EC norms. 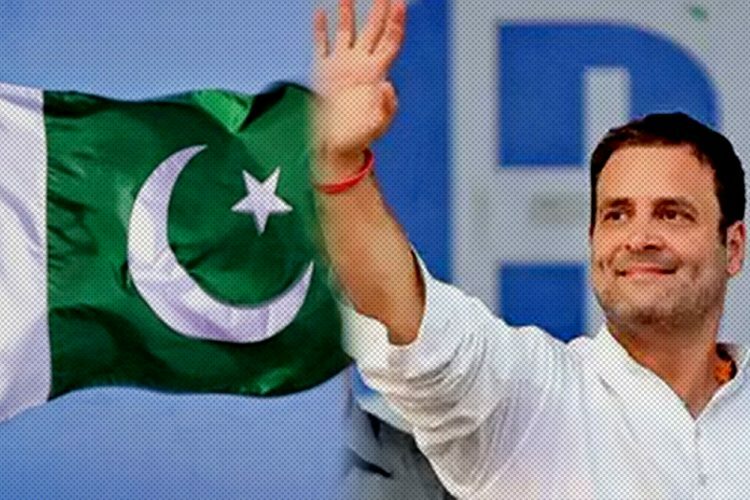 The Logical Indian, while acclaiming that the EC’s show cause notice to Congress President was necessary and upholds law, urges the guardian of free and fair elections in the country to hold responsible all parties, especially the one that forms the ruling government, for violating elections norms.